Bridget recognizes how her transition from successful lawyer to stay-at-home mother has shattered her personal image but doesn’t connect this shift to the ghost’s appearance until late in the novel. She has bigger fish to fry, namely taking care of her baby daughter Julie, keeping up with neighborhood mothers, and, as of late, trying to keep her sanity from slipping away as the ghost flutters around her home. It’s not immediately clear how Bridget’s actions managed to conjure the ghost, but it clearly wants something from her before it leaves. If it ever leaves. While most stories might build slowly towards the ghost’s eventual reveal, ratcheting up the tension with each event, THE BARTER introduces it early on before focusing on its purpose rather than paranormal effectiveness. And, in one of the more intriguing narrative decisions to grace horror literature, the ghost becomes as much of a character as Bridget when we learn who the ghost is. Or was, rather. At the beginning of THE BARTER’s second chapter we’re rushed backwards in time to the early 1900s where we meet Rebecca, a beautiful young woman on the cusp of marriage. Each subsequent chapter switches between the two women, and Adcock is able to delicately weave the two storylines together with similar themes and emotions. With each chapter, it becomes more and more clear what Rebecca’s ghost is doing in Bridget’s modern home, even though the actual circumstances of her death are held close to the chest. Besides their newborn babies and Texas location Rebecca and Bridget’s narratives couldn’t be more different, which lets us do more of the legwork in connecting the dots between them. One undeniable similarity, however, is how each is forced to cope with the duality of motherhood: the child you love is, in a lot of ways, your prison. Bridget, for example, is exhausted and irritable but she wouldn’t trade her time with her daughter Julie for anything. Sure, it’d be great if her husband helped around the house. It’d be nice to return to her career and interact with adults. But her love for Julie is the most pervasive force in the entire novel. It’s her safety blanket, the one thing she would gladly die for and the source of endless joy. Rebecca’s love for her son Matthew, on the other hand, is something she grows into. He arrives after we’ve had time to see Rebecca’s weary response to life on the Texas frontier and he places yet another struggle onto her frail, but ever strengthening shoulders. She loves him, but there’s no denying that he only binds her to the land, to this life, even further. With the insight she packs into THE BARTER I can only assume that Siobhan Adcock has traversed the Trail of Motherhood herself. She’s able to capture the frustration and total bliss of motherhood in a way that is touching and enlightening to a guy who will never have this exact experience. She’s not writing to convince men that motherhood is hard, but rather to value their wives and appreciate their individuality. Communication between husband and wife is key for Bridget, Rebecca and, by extension, us. By alternating between these two stories, each separated by more than a century of time and progress, Adcock elevates an eerie yarn into an ideological statement. In both timelines, societal pressures and gender expectations batter the two women, attempting to mold them into something homogenous. THE BARTER rebels against this archetype, arguing instead for personal worth as a pathway to happiness. It’s not hard to imagine this thematic focus deteriorating into a muddled, ineffective statement, but Adcock manages to make her feminist fable broad enough to apply to any and all women. There’s no agenda or political bent here, as long as you recognize the immense power you have as a woman and a mother. In a lot of ways, Bridget and Rebecca are opposites, complementary angles that explore the fundamental dichotomy of motherhood: even though society and family all have their expectations and demands, motherhood – and womanhood – is intensely personal. There are no right answers. Adcock underscores this by avoiding any generalizations about motherhood. Bridget and Rebecca both have their own preferences, as do the mothers that make up Bridget’s hip social clique. There’s Gennie, for example, who makes motherhood look frustratingly simple, and Martha, whose love for her own children didn’t change her desire to run back to the office as soon as possible. This statement gives power to women, particularly mothers who may worry about inadequacy. At the end of the novel, this is the lesson Rebecca’s ghost is here to impart, as spoken with force and conviction by Siobhan Adcock. Risking safety and personal desires yields power. “The power to define the meaning and shape of your own life, and not have it shaped for you by an acid shroud of fear, self-doubt, misperception, powerlessness.” Even though the novel ties this power to a specific, fantastical exchange (different mothers giving up an hour of their own life and an hour of their child’s), the sentiment remains an affecting and important coda. 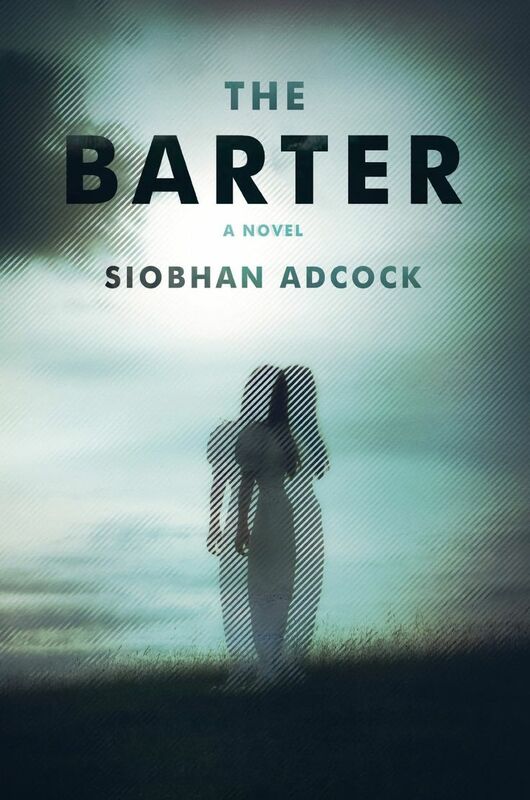 Perhaps the best praise for THE BARTER comes from within the novel itself. Throughout the story, characters, particularly women, are telling stories, often to their children. After all, stories are the earliest way children learn about the world and THE BARTER is filled with so much truth and emotion that it becomes yet another worthwhile link in the chain. Siobhan Adcock is here telling us a thrilling and emotional story of fear, expectations, courage, and personal triumph. You’d be a fool not to listen.